94 Foot Knight & Carver Sportfisher | Christian & Co. The vessel was inspected while afloat. Hull construction material is fiberglass over plywood (4 x .5” plywood layers). Deck is constructed of fiberglass over plywood and above deck structures are constructed of fiberglass over plywood. Bulkheads are constructed of plywood. Overall condition of the hull structure appears good. The vessel’s weight is 200,000 lb. (reported). Exterior rails and hardware appear good. Cosmetic condition of vessel appears satisfactory – good externally and satisfactory – good internally. Vessel’s external colors are white with yellow boot stripe. Below waterline through hull fittings appear good. The vessel is equipped with one engine driven and two Rule 1500, one Rule 3700 and one Flotec (six in total reported) electric / automatic bilge pumps that appear good and the bilge is holding minimal water. The ventilation system consists of two blowers and natural ventilation and appears satisfactory. General housekeeping appears good – excellent. Engines external surfaces appear good and exhibit no rust, oil or coolant leaks. Engine hour meters exhibit S – 9,166 and P – 9,185 hours. Motor mounts appear good. Cooling system appears satisfactory – good. Fuel system and components appear satisfactory – good. Exhaust system and components appear satisfactory – good. Electrical system and components appear satisfactory – good. Engine control system appear satisfactory – good, and shaft logs appear satisfactory – good. Steering control system appears good and rudder ports appear satisfactory. Generators surfaces and motor mounts appear satisfactory – good. Generator’s peripheral components and systems appear satisfactory – good. Waste system and components appear marginal, repairs are underway. General service seawater systems appear satisfactory – good. There is 5,000 gallon capacity in five steel tanks, two are located outboard in engine room, two are outboard forward of engine room and the day tank is on centerline forward of engine room. Fuel tank surfaces, where visible, appear satisfactory and the securing mechanism appears good. The fuel fill, vent, feed and return lines and components appear satisfactory. Fuel shutoff valves are located in engine room and appear satisfactory. The AC shore cord, inlet and connections appear satisfactory – good. The AC wiring and outlets appear satisfactory – good. The AC main feeds are protected with circuit breakers. Battery arrangement appears good. Batteries are equipped with disconnect switches. DC wiring appears satisfactory. Circuit protection for the AC and DC branch system appears satisfactory. Wire terminations and connections appear satisfactory. Wire organization and arrangement appears satisfactory. Vessel has eight dry chemical units and one foam portable fire extinguishers with April 2015 certification. Vessel has a halon 1301 fixed fire suppression system with April 2015 certification. The safety components include: numerous type I adult, nine child type I PFDs and two life rings, MOB strobe, retrieving line throwable PFDs; distress flares with current certification ; Survivetec 10 person (July 2018) and Avon 8 person (no visible date) life raft; Danforth anchor with chain and line rode that appears good (short). Navigational and anchor lights appear good. Other safety equipment includes: fire alarm, 406 MHz EPIRB, AED unit, Honeywell MS-9200UDLS fire alarm control panel. The vessel was inspected at its normal slip location. Line condition and arrangement appears good. Boarding hazards appear insignificant. All entry points are reportedly kept locked. Other security consists of a security system and locked dock gates. The vessel is a fiberglass over plywood motor vessel equipped with two diesel engines and three diesel generators. The original owner was reportedly the Daley Corporation and Solar Turbines, Inc. purchased the vessel in 1996. The generators were replaced in 1997. The vessel was maintained by a full time crew of three, one is currently on leave. The engines and transmissions are original with no major rebuilds. The hull bottom was just painted last week at the Marine Group Boat Works. The vessel was inspected in its slip, the vessel was not taken on a sea trial, the machine systems were not tested and the vessel was not hauled for survey. The vessel is actively and well maintained. The captain exhibits a wealth of knowledge regarding the vessel and its systems. The vessel is mostly used for corporate entertainment in San Diego Bay and very occasionally for fishing. 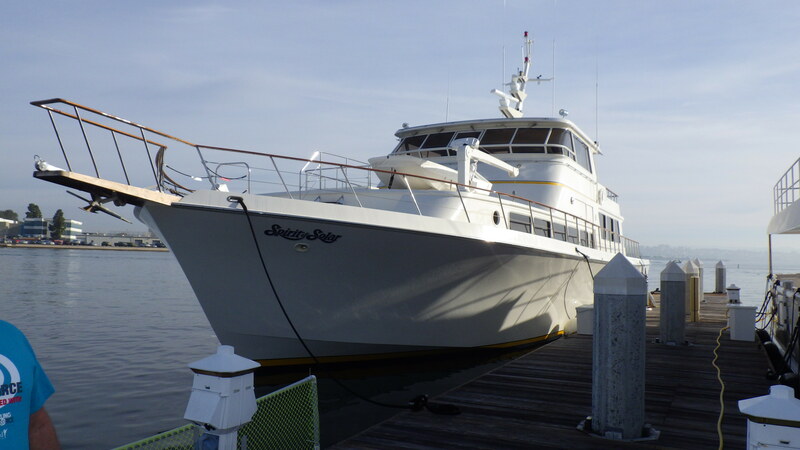 The vessel is well suited for its intended purpose as a corporate entertainment vessel. Replace wing nuts used on battery terminals with steel nuts and lock washers and comply with A.B.Y.C. (or similar) recommendations. Replace the broken hose clamp on the starboard fuel fill hose at the tank connection. Address weeps or leaks at the starboard rudder port and aft holding discharge through hull, eliminate weeps or leaks and remove stains and salt crystals to allow detection of any future weeps or leaks. Complete the repair of the waste system and prove it properly functional. Replace the EPIRB battery that had a battery date of 6/10. The water make is reportedly inoperative, address if/as desired. This survey sets forth the condition of the vessel and components, as specifically stated only, at the time of inspection and represents the surveyor’s honest and unbiased opinion. The submitting of this report should not be construed as a warranty or guaranty of the condition of the vessel, nor does it create any liability on the part of Christian & Company or the individual surveyor. No part of the vessel was disassembled or removed and no assumptions should be made as to the condition of concealed components. Specifics were obtained from sources available at the time of inspection and are believed correct, but are not guaranteed to be accurate. This inspection was performed for the expressed purpose of obtaining insurance/finance and should provide the information necessary for underwriting purposes. If any additional information is required, please contact the undersigned. This survey report is not intended for use as a “buyer’s survey”.